Charolais met an insatiable demand from a packed ringside selling to a top of 20,000gns and 102 bulls sold for a record average of £5,147. This represented an 88% clearance of the bulls forward, with 4 more bulls sold, at an increased average of £503 on 2011, in Carlisle on Saturday 12 May at the breed society’s official spring show and sale. Leading the day’s trade was the junior and supreme champion Beechtree George TI +40, SRI +43, knocked down sold to J G Wilson, Alford, Aberdeenshire at 20,000gns. This 15 month old by Gretnahouse Archangel and out of a home-bred dam was from D Burkhill, Driffield, Humberside. A joint bid of 12,000gns from R A Milne, Elgin, Morayshire and W K and P Drysdale, Blairgowrie, Perthshire secured the 16 month old Caylers Gladiator TI +54, SRI +54. This Balmyle Addition son and out of a home-bred cow was bred by Caylers Charolais, Nuthampstead, Hertfordshire. Caylers also took 8,000gns for Caylers Gallagher, a Thrunton Dominator son out of a home-bred cow. This 13 month old was purchased by R Jones, Llanllyfni, Gwynedd. Two lots were claimed at 11,000gns. First came 17 month old class winner Newhouse Fourstar TI +63, SRI +53, by the 18,000gns Sackville Claudius and out of a home-bred dam from R M Adam and Son, Forfar, Angus selling to R Leiper and Co, Newcastle upon Tyne, Tyne and Wear. A call of 11,000gns also secured Westcarse Gold TI +38, SRI +36, a 16 month old by Kersknowe Clansman and out of a home-bred cow for Backmuir Trading Ltd, Keith, Bannfshire. This one was bred by J H Christie and Son, Stirling, Stirlingshire. Backmuir Trading made four further purchases including Drumlone Figaro TI +32, SRI +26, by Drumlone Delboy and out of Thrunton Christina, a 20 month old from K Veitch, Lisbellaw, County Fermanagh for 10,500gns. The same buyer also made two calls of 6,000gns. First secured was 19 month old class winner Rumsden Fermanagh by the 55,000gns Sportsmans Columbo and out of a home-bred dam from Rupert Taylor Ltd, Uckfield, East Sussex. Backmuir Trading also bid 6,000gns to secure Sportsmans Galant ET by the 14,000gns Sackville Adonis and out of a home-bred dam. This 15 month old was bred by Boden and Davies, Stockport, Cheshire. Next came two lots at 10,500gns. First came the intermediate male champion Thrunton Firecracker TI +54, SRI +51, by the 26,000gns Balmyle Dickler and out of a home-bred dam. This 17 month old from J H C Campbell and Sons, Alnwick, Northumberland sold to A S F Cant, Arbroath, Angus. The same breeder took a matching bid for Thrunton Firebrand TI +55, SRI +44 by the 22,000gns Newhouse Bigal and out of a home-bred cow. This 16 month old went home with O W T Chandler, Crucorney, Monmouthshire. The Campbells also welcomed a bid of 10,000gns for the 20 month old Thrunton Flashgordon TI +43, SRI +33, another Bigal son and out of a home-bred dam selling to J C Hobday and Son, Hawick, Roxburghshire. The senior and reserve supreme champion, 19 month old Stranagone Farren ET by the 55,000gns Thrunton Voldemort and out of Ballyshannan Valerie was knocked down sold next at 9,500gns. This one was bred by R McWilliams, Maghera, County Londonderry and was purchased by P W Jones and Sons, Builth Wells, Powys. Two lots were sold at 9,000gns. Baillieston Forecast TI +58, SRI +60, a 17 month old by Dingle Hofmeister and out of a home-bred cow was first to be knocked down sold at 9,000gns to W and J Prentice, Thornhill, Dumfriesshire. This one was from W R Baillie, Deerness, Orkney. Class winner Edenhurst Galaxy TI +29, SRI +30 also sold for 9,000gns to T Walker and Son, Tweeddale, Lothian. By the 28,000gns Goldies Champion and out of a home-bred dam, this 15 month old was bred by P W Vasey, Carlisle, Cumbria. The same breeder also sold class winner Edenhurst General TI +27, SRI +26, a 16 month old by the 55,000gns Sportsmans Columbo and out of a home-bred cow to J B Paterson, Amisfield, Dumfriesshire for 7,000gns. A bid of 7,500gns was made twice. First came Sevenoaks Fortune ET, a 17 month old Goldies Champion son and out of Midas Destiny. This one was bred by G G and H E Sevenoaks, Abergavenny, Monmouthshire and was secured by M Bindloss and Son, Penrith, Cumbria. 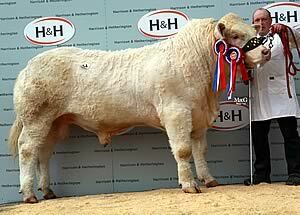 Class winner Clonatrig General was also purchased for 7,500gns by M Roberts, Machynlleth, Powys. This 13 month old by Dunlon Ulick and out of a home-bred dam was bred by Balfour Brothers, Enniskillen, County Fermanagh. Four lots were purchased at 7,000gns. Balthayock Flamenco TI +73, SRI +72, by Balthayock Adonis and out of a home-bred dam went home with Auchencheyne, Moniaive, Dumfriesshire. This 21 month old was from Major D F W H and N R Walter, Perth, Perthshire. Lagavaich Fernando TI +40, SRI +41, by Corrie Druid and out of Cyglen Shirley was knocked down sold to J Jeffrey, Kelso, Roxburghshire at 7,000gns. This 17 month old was bred by A and A Wright, Ballindaloch, Banffshire. Rumsden Fanta, a 16 month old by Rumsden Cruiserweight and out of a home-bred dam from Rupert Taylor was also knocked down sold for 7,000gns to A and D Bell, Carlisle, Cumbria. The same breeder also sold Rumsden Fungus, an 18 month old by Limkiln Bosco and out of Sackville Sinitta for 6,500gns to H and A Hiddleston, Park, Irongray, Dumfriesshire. Fourteen month old Maerdy Goshawk TI +33, SRI +27, by Maerdy Dynamite and out of a home-bred dam from D E Evans, Mold, Flintshire was knocked down sold at 7,000gns to R and C M Donnan and Sons, Newton Stewart, Wigtownshire. Two lots were purchased for 6,500gns. First came class winner Brampton Fanfare TI +34, SRI +34, by Trefonnen Crouch and out of a home-bred cow from G W Turner, Ripon, North Yorkshire. This 17 month old was purchased by G D Herdman, Alnwick, Northumberland. Goldies Fiesta TI +48, SRI +51, by Goldies Uppermost and out of a home-bred dam was secured by Burnton Farms, Laurencekirk, Kincardineshire. This 17 month old came from H Goldie, Dumfries, Dumfriesshire. The female trade was led by the female champion, Goldies Fatima, a two year old heifer from Hamish Goldie by the 28,000gns Goldies Champion and out of a home-bred dam. She was knocked down at 5,000gns to P Gallagher, Maghera, Derry, N.Ireland. New breeders E J and A M Fox, Wooler, Northumberland, purchased Baillieston Francis, a two year old heifer that had been running with Baillieston Donald for 4,700gns. Francis was by the 15,000gns Maerdy Deinol and out of a home-bred cow as part of a draft sale from the Baillieston herd. The top female lots were dominated by purchases from T Jones and Son, Dryslwyn, Carmarthen and S M and C R Colinswood, Thame, Oxfordshire. The first of the Jones’ buys was Goldies Fancy, a two year old from Hamish Goldie in calf to the 34,000gns Goldies Uppermost for 4,000gns. Fancy was by the 8,000gns Blelack Blackberet and out of Goldies Abigail, sister of the 14,000gns Goldies Banker. The same buyers then put in a call of 3,500gns for the reserve female champion Goldies Freckle, also from Hamish Goldie. This 21 month old heifer was by the 25,000gns Thrunton Camelot and out of a home-bred dam, Goldies Ali, a daughter of the 25,000gns Goldies Unbeatable. Sticking with Goldies, the Jones’ also bid 3,000gns for 21 month old Goldies Flora, another Camelot daughter and out of a home-bred dam. The Colinswoods took home four lots starting with Baillieston Fairy, a two year old heifer that had been running with Baillieston Donald for 3,100gns. This one from the Baillie’s draft was by the 17,000gns Mowbraypark Umpire and out of a home-bred dam. They went on to make three purchases at 3,000gns starting with Goldies Fifi, a two year old from Hamish Goldie at 3,000gns. Fifi was by the 28,000gns Goldies Champion and out of a home-bred dam by the 25,000gns Goldies Unbeatable. Next came another Goldies heifer, 21 month old Goldies Fairylights ET by Dingle Hofmeister and out of a home-bred dam at 3,000gns. The Colinswoods also bid 3,000gns for Goldies Floss, a 21 month old by the 34,000gns Goldies Uppermost and out of a home-bred dam. Averages: 24 senior bulls, £5,269.70; 38 intermediate bulls, £5,319.08; 40 junior bulls £4,911.38. Overall 102 bulls, £5,147.58. 11 females, £3,331.